Panwrypter (pan.rip.ter) is a new way to protect your most sensitive files from cyber-attacks, malware, and other unauthorized access. Panwrypter transforms the fabric of your files into non-linear protected volumes, using a process called bitwise depletion. This approach allows you to protect your files using a decentralized storage approach that is based on your existing familiar preferred storage services & media. In the context of Panwrypter, depletion is the process of preparing your files and information into non-linear protected volumes that can then be securely stored at 2 or more storage sites. More information on bitwise depletion. The central premise of using Panwrypter is that the protected volumes for each site must be physically or logically separated across different Internet and Non-Internet connected storage sites. The location of the storage sites is only known by the creator of the protected volumes, which allows them to remain protected over time. A protected session is created when you protect your files and folders, and is a folder containing all of the protected volumes for each storage site you defined when you first protected your files. 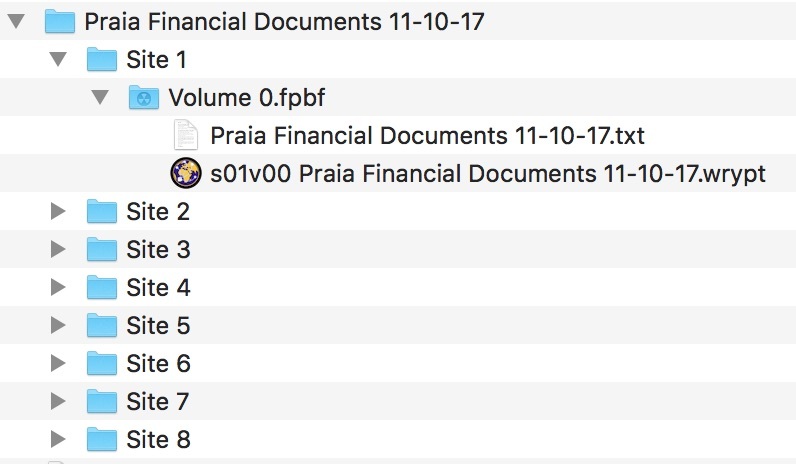 By default, all of the protected sessions you create are stored in a temporary sessions folder on your Mac, which acts as a temporary holding place, until you can transfer them to their designated storage sites. You can set the location of your temporary sessions folder using Preferences. The session manifest is a list of the files and folders in a Panwrypter protected session. It is stored in a text file in the Site 1/Volume 0 folder of the protected session. In cases where it is not needed, or is considered a security risk, it can be erased manually through Finder, or using the "Erase Session Manifest" option on the restore screen. A storage site is any secure physical or online data storage location that you entrust for storing your protected files. Instead of forcing you into using a particular storage service or host, Panwrypter allows you to define where you store your protected files. You are thus free to determine how and where you will store the data from each site to ensure your files remain secure. The most important point is the storage sites are physically separated and known only by you. More information on Selecting Storage Sites. A protection scheme is a feature of Panwrypter that allows you to save the custom configuration of your storage sites & media, so that you can efficiently re-use it, when protecting files again at a later time. In addition, Panwrypter comes with several built-in protection schemes that you can either modify, or use directly. More information on Protection Schemes. Automatic transfer is a feature of Panwrypter that will transfer your protected volumes from your Temporary Sessions Folder on your Mac, to your designated storage sites following successful protection of your files. You typically provide the location of each storage site on the "Storage Sites & Media" screen, after enabling the automatic transfer checkbox. Disabling the automatic transfer option means that your protected volumes will be left in your Temporary Sessions Folder on your Mac, so you can manually transfer them to your storage sites at a later time. More information on automatic transfer. The temporary sessions folder is the folder used by Panwrypter to store your protected sessions, which are created when you protect files and folders. When you run Panwrypter for the first time, you are prompted to provide the location of your temporary sessions folder. 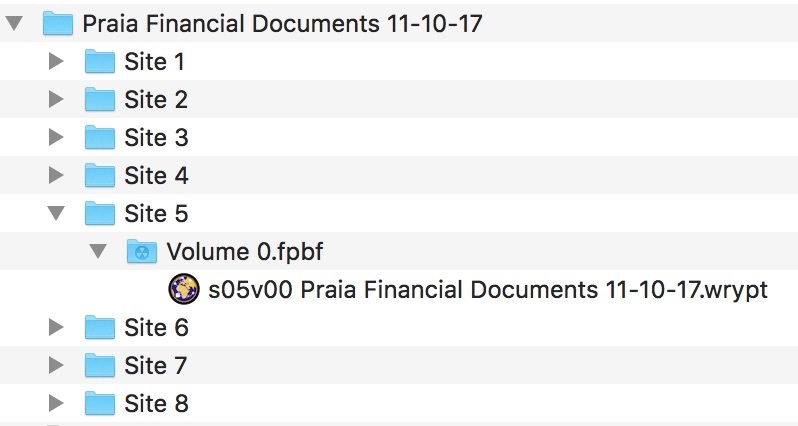 You can change the location of this folder by going into preferences. Site clues are text labels you apply to each storage site that help you recall the details of that storage site at a later time. Ideally, the site clue you provide should be explicit enough to help you remember the site location, while being vague enough to prevent others from doing so. When you provide site clues for each of your storage sites in the "Storage Sites & Media" screen of Panwrypter, a clue card will be generated for your protected session that you can print and store in a safe place for use when you need to recall details of your storage sites. More information on clue cards. A clue card is an optional, convenient and secure way to document the session name, and site clues of your protected session in a non-electronic manner that is separate from your storage sites. Clue cards help you recall the location of your storage sites, so you can more efficiently collect/regroup your protected volumes again at a later time. Typically, a hardcopy of a clue card is printed, and stored in a safe place, for use later. When you need to restore your protected session, simply scan the clue card from the Collect screen, and the site clues and session name will be revealed to assist you in collecting back your protected volumes. Losing your clue card does not mean you have lost your protected files. It just means that you need to be able to remember the location of your storage sites when you want to restore your files. An allowed restore location is any designated physical location from which you will allow the restore of your Panwrypter protected session. Allowed restore locations are defined when you first protect your files and folders to create a protected session. When you want to restore your protected files at a later time, you must be within range - defined in preferences - of any one of the allowed restore locations that you defined previously, or you will not be authorized to restore your files. This type of security measure is useful in the event that an attacker is able to recover all of your protected volumes from all of your storage sites, since it prevents recovery of your files if the attacker is not in one of the allowed restore locations that are known only to you. More information on restricting restore locations.